Ruby Bridges went up the steps of her new school. Ruby was in first grade. In 1960, protected by U.S. marshals, first grader Ruby Bridges faces mobs and taunts when she walks up the steps of the all-white William Frantz Public School. When white parents remove their children from Ruby's classroom, Ruby studies alone with her teacher. As the first African-American student to integrate New Orleans' schools, Ruby paves the way for generations of students. 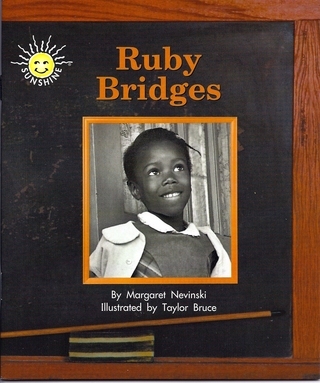 Ruby Bridges (Wright Group/McGraw-Hill) is the powerful story of one girl's bravery. Told with simple text for Grades K-3, and featuring historical photos, this early reader introduces young students to a tumultuous period in U.S. history. When Ruby was in first grade, black and white children went to different schools. Only white children went to this school. Many people wanted this to change. They wanted black children to go to this school, too. Ruby was the first. Other people did not want black and white children to go to school together. When Ruby went to school, they yelled at her. Ruby held her mother's hand. Her mother said, "Don't be afraid." Ruby Bridges was an inspiration to me, and I wanted to convey the complexity of her story in simple terms. I tried to imagine myself as a first grader confronting hate and prejudice. Everything I read about Ruby showed her dignity, and that gave me courage to tell her story.